A Garden Bench with rockers? What a novel idea! 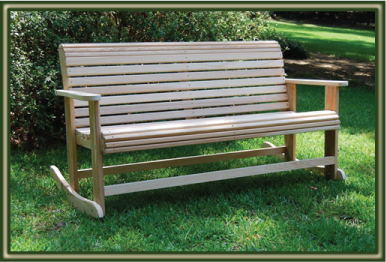 Similar to our rollback rocking chairs, Cypress Moon Rocking Benches also feature a rolled front and back for less irritation and a contoured seat for extra comfort, but are available in 3-5ft widths Cypress is a beautiful, distinctive and durable wood that assures years of trouble-free satisfaction. It has a natural preservative oil known as cypressene, which gives the wood natural resistance to insects and decay. As with all Cypress Moon Furniture, price includes FREE SHIPPING!